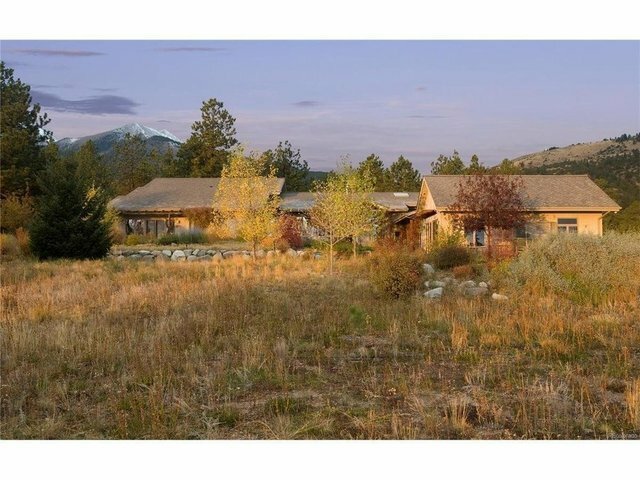 The home and 550 acres sit at the base of Mt. Princeton. All the lands have been placed in protective conservation easements to preserve for all time the wildlife, ecological, and scenic values of this majestic location. The entire western boundary of the property borders a mile of San Isabel National Forest. The land is mostly forested with a variety of tall pine but there are also open grazing areas, meadows, a haying field, aspen groves, historic structures, and water rights. The main living area of the spectacular home is 3,921 square feet with additional space above the three-car garage and in the finished basement. The home was designed to meld into the existing landscape, taking advantage of views & the rising and setting sun directions. The many windows bring the outside in and allow light to enter throughout the day. Mature landscaping, decking, and stone work create several private outside areas to enjoy the natural beauty and peacefulness of this very special location.